Today I am thankful for God's timing. Now I have to be honest, that almost felt like swallowing vinegar to type that out. Because God's timing isn't always easy, nor does it always align with what I feel is the best timing, but it's crazy how well he knows me before I know myself. And how I'm constantly reminded that His timing is best and therefore I am thankful for it. When we got pregnant with Eli we were not planning on getting pregnant anytime soon. As soon as I saw that positive pregnancy test I was scared, scared, scared. This did NOT fit into my plan and what I had written down as to how life was supposed to go. We weren't ready in any way, shape or form, but that didn't matter. God knew. Now I always say Eli was the best gift I didn't even realize I wanted. After Eli was born I wanted nothing more than to be home with him full time, but it wasn't an option. So I went back to work, thankfully I was able to work part-time, and then about a year and a half later I made the transition to a full time stay at home mom. It was hard going back to work when I didn't want to go but I am so thankful for that time. I was blessed with a great job and fun but professional workplace. Going back to work helped me to truly appreciate staying home with Eli. I now see it as a gift that I never want to take for-granted. God knew I needed that time. His timing. I had a plan when I wanted to get pregnant with baby #2 and then my plan took a little longer than expected. Not much, but enough to get off track from what I thought would be the perfect time. Now I realize how inconvenient my plan would have been. Yes it would have been ok, but perhaps not the best. I really only want God's best even if it means sometimes I have to wait or not get my way. When we sold our house in six days we considered it a miracle. It seemed to good to be true. And then since then there have been many days I have questioned God. Why did our house sell so fast if it was only going to be a pain of circumstances to follow? I have to admit, it's been a bit frustrating, but there have been several factors that have confirmed we are doing what we're supposed to be doing at this moment. I get frustrated, angry, and experience moments of doubt and confusion many times in life through various circumstances but I'm reminded that His ways are higher than mine. His thoughts are higher than my thoughts. So right now during a time that I'm dealing with all those emotions I'm still going to be thankful for God's timing. In the moment I may not see it or even want it, but I know that His timing is better than anything I could imagine. And I will continue to remind myself or numerous situations in life that have proved that His timing is much better than mine. 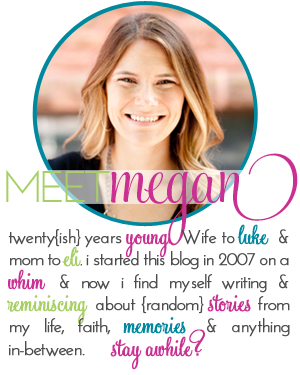 Really really loved this post, Megan! Thanks for your honest heart and the reminder that God's timing is infinitely better than our own.